Junior Dos Santos is a bad man. The amount of power that some behind the fastest hands in the heavyweight division are just scary. The amount of fights Dos Santos has won from the middle of the cage are second to none, and I don’t see him trying to take this fight anywhere differently. If you want to know how to beat him, ask Velasquez. Force him towards the cage and make him fight from his back. That’s another problem though, his 76% takedown avoidance makes it quite difficult to expose his weaknesses. Dos Santos will wear you down with his powerful jabs and combinations and won’t even let you breathe in-between. Another reason why you can force Dos Santos towards the cage, his feet. He’ll move you around before you can even think about moving him. He’ll move in-and-out, land significant blows then finish you off. My advice for Junior Dos Santos would be to not fix what isn’t broken. Miocic has a substantial wrestling background and will shoot a double when he sees you blink. 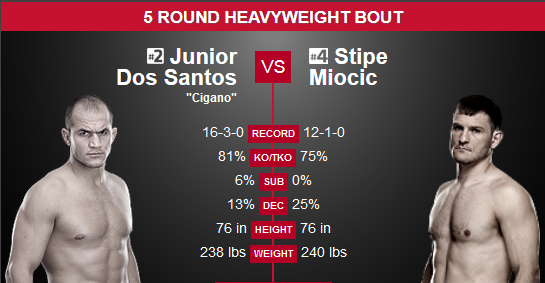 If Dos Santos can keep this fight on his feet and make Miocic one-dimensional, this one will be over quickly. Stipe Miocic has been fighting out of his mind lately. His last fight back on May 31st lasted only 35 seconds and ended by TKO. Miocic has a substantial wrestling background and has no problems against the cage or being on his back and keeping control of the fight. Both of these fights has very similar skill-sets when it comes to being in the center of the cage. Both has fast hands and like to move around to disrupt the others timing. the slight difference in how they move is that Miocic likes to circle rather than making lineral attacks. If Miocic can circle Dos Santos and disrupt his movement and throw off his timing, shoot a quick double, he can take control of this fight. This entire fight will not be fought on their feet and Miocic needs to take serious advantage of that. The more time Miocic can Dos Santos struggle trying to get up, the more tired Dos Santos will become making his combinations much less powerful. Also, don’t think that Miocic trying to take shots will wear him out either. With his wrestling back, his conditioning is topnotch. My advice for Miocic would be to take shots, a lot of them. Keep making Dos Santos work to get up, and let him. Your hands are nearly as powerful and you can last much longer. Stick to your fight-plan, circle, jab, shoot, and repeat. This is going to be one hell of a fight. Both of these fights have very similar skill sets and tendencies inside of the octagon. Dos Santos will obviously want to keep this match on his feet for as long as possible, blocking shoots taken by Miocic trying not to waste too much energy. Miocic will be taking shots on Dos Santos, many of them. He’ll want to utilize his wrestling background to wear Dos Santos until possibly knocking him out. I guess the big question is whether the momentum by Miocic can subdue to drive for Dos Santos to have that one last shot at Velasquez. If you ask me, I think Dos Santos is just too much for Miocic to handle. Dos Santos will be refining his already phenomenal take-down defense and be preparing for the circular movement of Miocic. Dos Santos will get another shot as Velasquez, assuming Velasquez can get healthy.